SILICON SLOPES, Utah — August 28, 2014 — Domo provider of the world’s first business management platform, today announced that it was recognized as a 2015 Emerging Eight company by Utah Business Magazine. 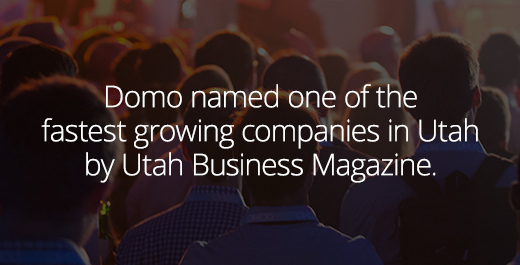 The 2015 Emerging Eight is part of Utah Business’s annual Fast 50 award program, recognizing top growth companies in the state. The Emerging Eight are chosen from companies in business less than five years that are showing a formidable impact on the Utah business landscape. Honorees were celebrated yesterday in a luncheon ceremony at the Grand America Hotel in Salt Lake City. A full list of all the Emerging Eight and Fast 50 winners can be found on the Utah Business website. This latest award follows Domo’s recent recognition by the World Economic Forum as a 2015 Technology Pioneer. The World Economic Forum’s Technology Pioneers program recognizes companies from around the world involved in the design, development and deployment of new technologies – focusing on companies set to have a significant impact on business and society. Domo’s recognition as a Technology Pioneer gives it access to the most influential and sought-after business and political network in the world through an invitation to the Forum’s Annual Meeting in Davos in January.